After CISCO, Samsung, Facebook, Intel and Microsoft, GE is planning on opening a Center of Excellence in the Paris Region. The opening of the Center of Excellence, follows the agreement between GE and the French government made in 2015 after the purchase of Alstom, in which GE committed to opening International Centers of Excellence specialized in grid and wind power, amongst other subjects. GE’s ambition is to become one of the 10 leaders in software, by 2020, an area where it already claims $6 billions of revenues. This confirms that global companies are increasingly beefing up their R&D teams in the Paris Region. One reason is the highly attractive R&D tax credit available to companies in France. The R&D tax credit amounts to 30% of annual R&D expenditures up to 1 million euros. The Paris Region is the number one region in Europe for R&D expenditure, amounting to 18.5 billion euros invested yearly. Another reason companies are conducting R&D in France is to have access to incredibly talented researchers and highly qualified engineers. Indeed, France is one of the leading countries when it comes to math, physics and robotics research. 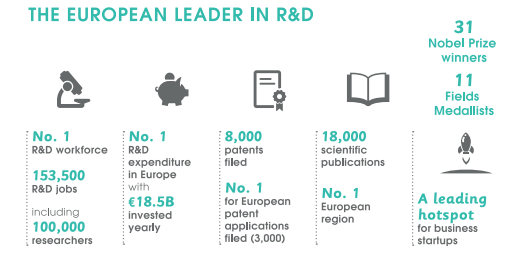 The Region’s excellence is internationally renowned with 31 Nobel Prizes and 11 Fields Medals, and 153,500 jobs in R&D, including 100,000 researchers. Samsung Electronics is another company that has set up an innovation center in the Paris Region to access skilled engineers. In the following video, Luc Julia, VP Innovation Samsung Electronics, explains why Paris Region is a good place to find highly qualified engineers and how the “Paris Region open innovation sourcing program” helped him develop its network in the Paris Region.